Sweet, a cupcake bakery in Boston is baking Oscar caliber cupcakes. If you are having an Oscar party in Boston, you want to order these cupcakes. 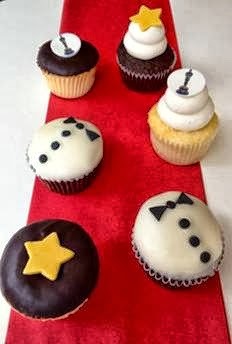 This weekend, you can enjoy handcrafted edible Academy Awards specialty toppers with golden statues, mini-tuxes and sidewalk stars a-top freshly baked Vanilla, Chocolate, Red Velvet or select seasonal flavors. Available at all locations, as well as for advance purchase online, for $4.25 each ($48 per dozen). Sweet has locations in Back Bay, on Newbury Street and in Harvard Square.